How do I get relevant information from a hard copy or digital source? What kind of resources can I use? There are many ways and things that help you get to good, reliable information. Lets start in a digital source (websites, articles, etc.). To start it off, you might want to try to find more websites that have URLs such as .org, .net, or .gov. Websites like .com could be reliable but are less likely. You will know if something is relevant if you can find it in other websites or articles around the web. For example, if you are researching dolphins, and you go to www.defenders.org, you would most likely find true facts because of the URL (.org). Also, you should be able to also find the facts in other websites like www.dolphins.org. There are also other websites that you can go to for information/pictures that are labeled for re-use. For example: ebsco host, explora, CIA world book, mid continent public library, library of congress, and TIME for kids. There are also good image resources like morguefile, pics4learning and creative commons (links below). How can I generate research question that helps me get relevant information? Some websites like Explora Middle School has an option that is called "advanced search" with is located underneath the primary search button. When you click it, a few extra search bars will drop down saying either, "AND", "OR", or "NOT". For example, if you search "galaxy" and don't want the Houston Galaxy soccer team mixed up in it, you could type "soccer" or "Houston" in the "NOT" bar and it will filter it out. The same goes for AND and OR. The option "and" would just be used to add another keyword to your search. Many other website have advanced search engines like this but they may not say exactly and, or, or not. When you are searching your topic, make sure that you narrow the search down as much as possible. Instead of searching, the civil war, you might want to narrow your search instead to "The Battle of Bunker Hill (Civil War)". How do I know if a website is credible or accurate? This is very important when you are researching a topic for an essay, project, activity etc. You always want to have accurate info and have it cited so you are good to go. To start off, a good rule of thumb is to look for websites that have .gov, .org, or .net because those would maybe be a little more reliable that a website with .com. For example, if you search 'Dolphin Facts' and see a website that is called dolphins-world.com and another called dolphins.org, you would most likely want to choose the dolphins .org so you can get better information. In websites, also try to find the publisher date (of an article) and the author and information on the author themselves to know if they are good or not. If you can find good, detailed info, you can probably rely on it. Plagiarism is the act of taking someone else creativity and work and presenting it as your own work. If you plagiarize in the future, you can get in some serious trouble like getting expelled or losing your job! You better now how to avoid this, and I got just the thing for you. Make sure that you always cite your source even if you paraphrase your work. You can also paraphrase but use little info. Another way to avoid plagiarism is to use common knowledge (CK). This is just basic information that most people know. For example, if a website says when Abraham Lincoln was elected president, you could just say that because it is common information. 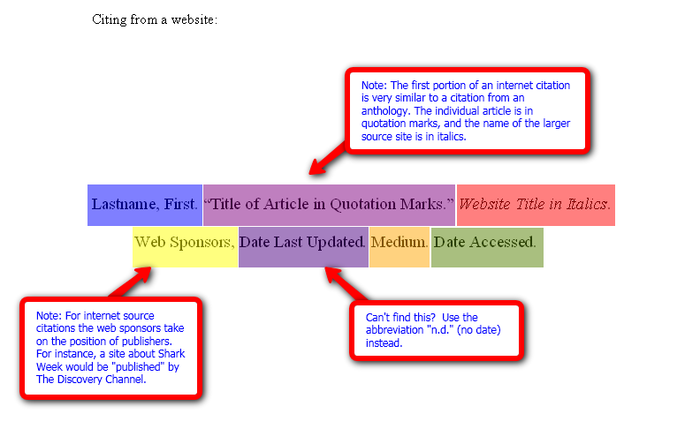 What's the difference between Summarizing, Quoting, and Paraphrasing? Paraphrasing: The act of taking the information from a text or author and displaying them in your own words and sentences. This is sometimes used to sound less bleak and more interesting. Quote: The act of taking the exact information and copying it into a work with quotes (" ") before explaining who made the information. Summarizing: The act of briefly stating the most importing parts and highlights of an information from something like an article or book. So Whats the Difference? Well, basically, one is rephrasing what the author said in your own words, the other is when we directly copy what they say with credit and quotes (" "), and the last is to briefly say the high points of the information. They all have their own aspect and while they all seem a little alike, they still are very different. Out of the many citations, one of the most popular and efficient is the MLA format. MLA In-Text Citation: When you do an MLA in-text citation, after the information you present, you show the author's name, (Last name, First name) and the page number that the information is from.